Two years ago, the Sculpto 3D printer appeared to make 3D printing more affordable and user-friendly for everyone. 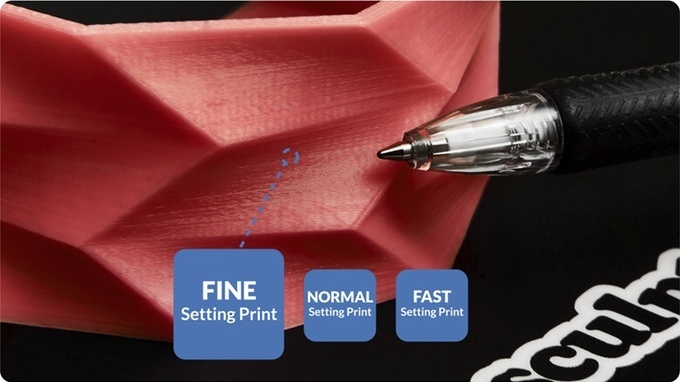 Recently, the new version Sculpto+ came with more useful features, making it a unique printer with the same printing area and price range. 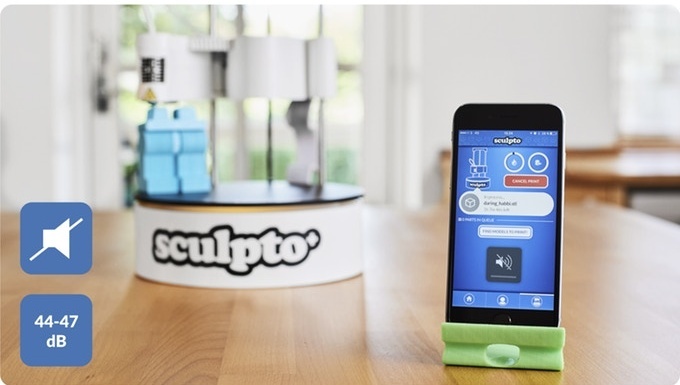 The Sculpto+ printer is a compact printer for beginners, kids and adults to start with 3D printing in a simple way. In addition to small size and lightweight, it provides a high printing performance with very low noise while working. It’s also connected wirelessly with a very easy-to-use app which makes the printing process simple and fast. We got the chance to try the printer in our lab and share our thoughts and experiences with you. The first thought we had while unboxed it is that the printer is compact enough to fit our desk and the construction quality was amazing. The design is solid and precise at the same time. The Sculpto+ gives three quality options for prints; fine, normal, and fast. Even at the normal setting, the quality is high enough to satisfy most users. The Sculpto application let you choose the option which fits your resolution and time needs. According to the team, an automated slicer software delivers unique high-quality prints by processing difficult trimmings and settings. 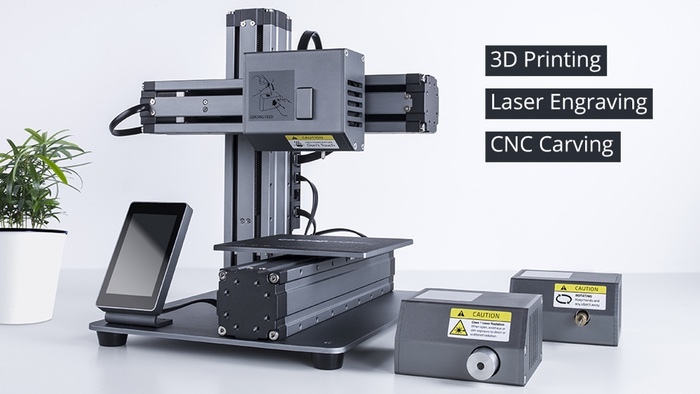 Compared to most other 3D printers, there is no need for any connection cable or SD card. The printer is completely driven by Wi-Fi, enabling you to print from any device you want without the need to sit close to the printer. The wide compatibility allows you to print using a smartphone, computer, or any other device that can run a web app. 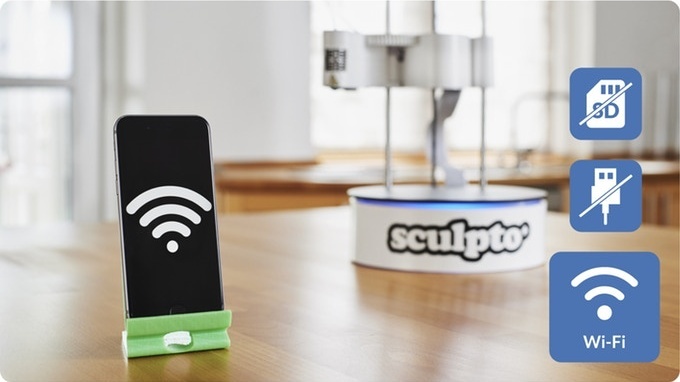 The Sculpto+ also has a built-in memory chip to store the necessary files for printing, so you can disconnect, go outside and the print will still complete successfully. The time needed to connect the printer to our smartphone for the first time was about 30 min. 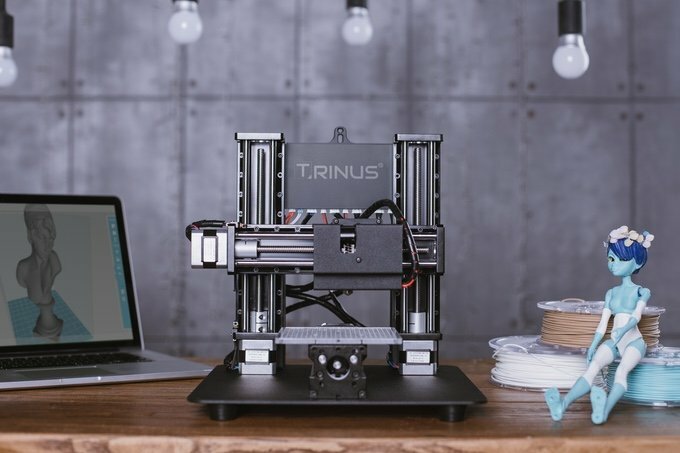 The steps needed to get it online and start printing was: download the app from play store, register a new user and login, connect your printer to smartphone and home network, calibrate z-axis, place filament and then we were ready to start our first print. As a 3D printer user, I love this feature a lot and I think it should be a primary feature for all 3D printers. Because staying connected to the printer all the time generates many limitations for users. Another nice feature of the Sculpto+ is that you can put it wherever you want without being worried about the noise level. The engineers of the printer took care of the printing noise and successfully reduced the printer sound level to 44-47 dB. That means only the fan sound will be heard which is similar to a townhouse background noise. The Sculpto+ delivers an easy-to-use application that makes the print simple as a one-click process. 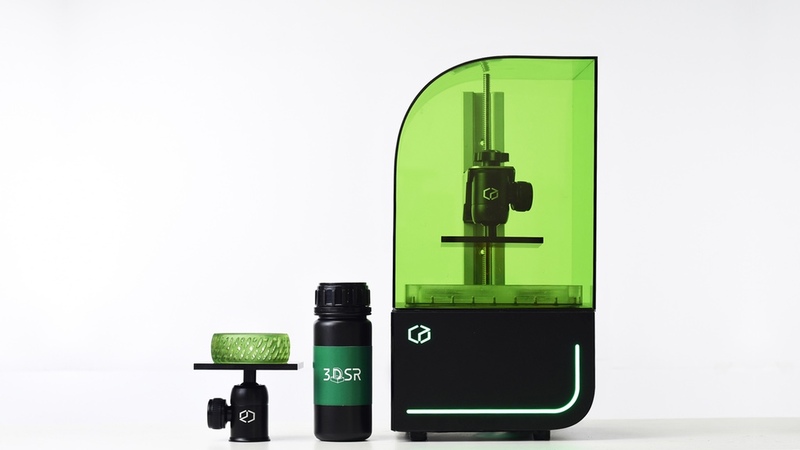 In addition, it integrates with Thingiverse enabling a huge library of 3D design to print immediately. Printing a custom design is also simple, all you have to do is upload the STL file and choose your recommended settings. While you send the model for printing and before the nozzle gets hot, the app asks to verify for your presence near the printer by applying the color pattern you see on the printer. This is a security measure to provide safe printing, but can be annoying to some users. The supported plastic filament is PLA (1.75mm), which is made of maize and sugar beets and is biodegradable. That filament is a sturdy plastic that can withstand a lot of stress, force, and weather. However, this limitation may not be preferred by many users as other types of filament has some additional advantages. (Engineers are working on adding more types of filament, e.g. filament that can be used together with food products) Providing high-quality printing and a wide range of filament colors should compensate for this for normal users. The printing area is 160 x 200mm enabling you to print up to a 5L volume. Operating system: The Sculpto iOS, Android, and web app. By the end of last September, Sculpto+ had a successful crowdfunding campaign on Kickstarter with a pledge of about $178,000. 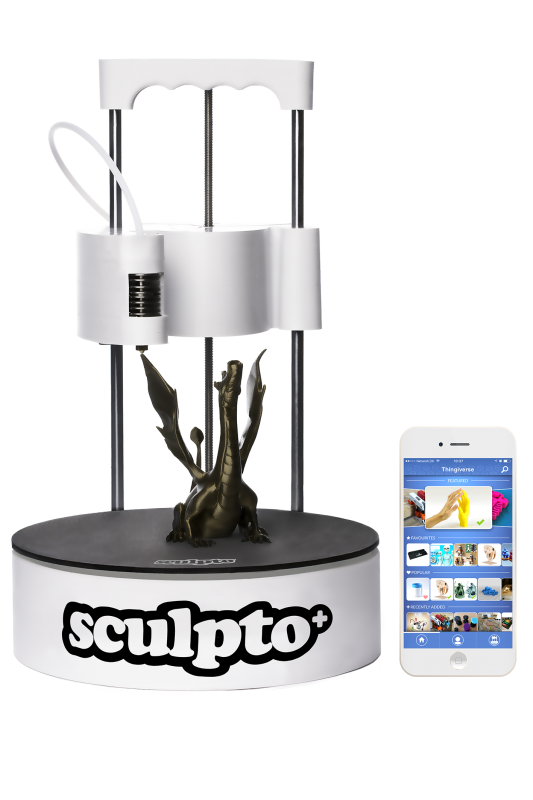 You can purchase a Sculpto+ through the official website for about $530 delivered within 5 working days. Finally, the Sculpto+ is a great and affordable printer at the same time. If you have a limited budget and want to buy a 3d printer to make some nice stuff, I think Sculpto+ is a good choice. But if you need it for product prototyping you should search for a more advanced one. You can find further details and information at the website. Don’t forget to share with us your opinions about this printer in the comments.